Hello ... Hello ... my old friends ... It's great to see you once again! 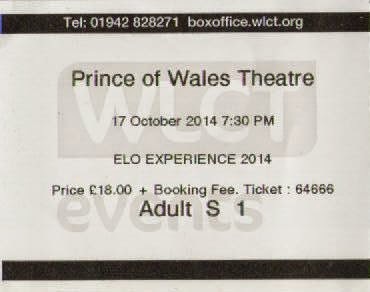 Cannock's Prince of Wales Theatre was rocked to the rafters last night [Friday 17th October] as Electric Light Orchestra tribute band The ELO Experience returned to the venue last night for the latest leg of their 2014 UK tour. Once again the Hull based octet, led again from the front by the wigtastic Andy Louis, delivered a stunning set of songs perfectly reproducing those ELO records we all know and love whilst bringing the studio produced a show that effortlessly showcased their vibrant string section bringing them much more into prominence, in particular, with "Can't Get It Out Of My Head" and "Strange Magic". As ever, such a great show makes it hard to select a favourite but for me the highlight of the night had to be their note perfect rendition of "10538 Overture". I could almost hear Roy Wood himself plunging his bow on a compliant cello! It capped yet another fantastic concert by The ELO Experience. Set list: "10538 Overture", "Roll Over Beethoven", "Showdown", "Can't Get It Out Of My Head", "Evil Woman", "Strange Magic", "Livin' Thing", "Rockaria! ", "Telephone Line", "Turn To Stone"; "Sweet Talkin' Woman", "Standin' In The Rain", "Big Wheels", "Mr. Blue Sky", "Wild West Hero", "Shine A Little Love", "Confusion", "The Diary Of Horace Wimp", "Last Train To London", "All Over The World", "Xanadu", "Prologue", "Twilight", "Hold On Tight", "Rock 'n' Roll Is King"
ELO Beatles Forever [ELOBF] recommends The ELO Experience to those enlightened folks who enjoy the music of ELO, Jeff Lynne, The Move, Roy Wood, 'Brum Beat', The Idle Race, The Beatles and related artistes.